Russia wants to save the world. 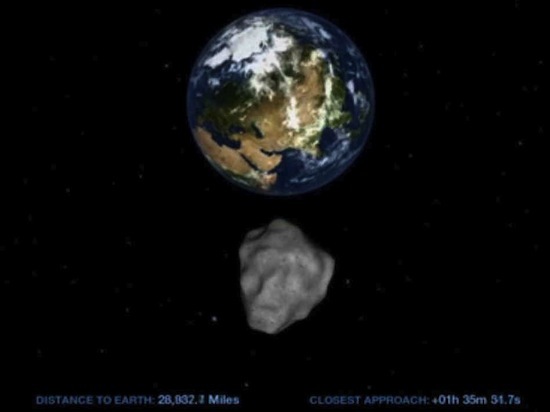 On March 5, 2016, Asteroid 2013 TX68 will swing by the Earth in the course of its trajectory. If you've got a telescope, then in all likelihood, you'll be able to spot this moving through the sky on that date. It seems that Earth is the place to be for the holidays, because we now have Asteroid 2003 SD220, AKA asteroid 163899 on its way to pay us a Christmas visit. Today in super-smart ladies doing super-cool things for each other, NASA's Amy Mainzer has named an asteroid she discovered after 17-year-old Nobel Prize winner and education activist Malala Yousafzai. Thank you, Zumiez. Thank you. 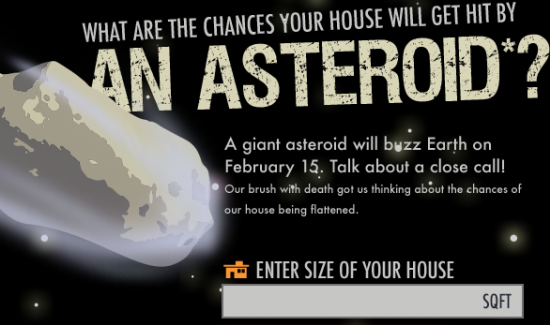 Fact: The Earth is as scary to asteroids as asteroids are to us. We're all so busy worrying what a close asteroid pass means for us and any ragtag teams of retired astronauts that no one takes the time to consider what it means for the asteroid. The Earth exerts some pretty strong gravitational forces, and when football field-sized 99942 Apophis passes extremely close in 2029, it's going to be just as much a shake-up for the asteroid as for our psyches. Sticks and stones may break your bones—or vaporize you, depending on their size. Wow, we're getting really good at detecting asteroid threats—right before they would potentially end the world, that is. The newest one is nicknamed "The Beast" and will come within 3 lunar distances of the Earth. That's far enough to keep us safe, but at the size of a football stadium, it's still unnerving that it crept up on us. Don't worry, NASA's known about it for ages. Like, four whole days. So here's a fun fact: while you were sleeping last night, you had a near-death experience. Yes, you - and everyone else on this lovely planet. In the wee hours of the morning, a pretty sizeable asteroid soared by the Earth, just missing it. But we're okay. For now. It's fun to see as long as it continues to stay far, far away. An asteroid called Erigone is going to give New York City and its surrounding areas a pretty good show on Thursday. No, it's not going to smash into us, which is for the best when you consider that it's about 42 miles wide. It's going to blot a bright star out of the sky for about ten seconds, which you won't even need a telescope to see. We recommend watching the webcast while wearing a deerstalker cap. Last September 11th, an asteroid collided with the moon at speeds of over 37,000 miles per hour, creating the brightest lunar explosion we've ever seen. Tonight's full moon will give astronomers the opportunity to investigate the site of the lunar impact; oh, and through a live webcast, you can watch too! It's still not dangerous, but a drinking game based on new asteroid discoveries might be. Yesterday, a 100 foot-wide asteroid flew by Earth slightly closer than the moon at 217,000 miles away. It turns out it wasn't alone, though, and an asteroid about the size of a bus will hurtle by today. It might be much smaller, but today's asteroid, 2014 EC, will be 1/6 of that distance at only 34,000 miles away. The universe's aim is improving. You take one look away from those sneaky space rocks to celebrate the new year and BAM! An asteroid with a near-Earth orbit was discovered yesterday, which is great news for anyone who thinks we should make an effort to have a warning system in place for potentially dangerous flying space rocks. Unfortunately, it was discovered right as it was about to slam into the Earth's atmosphere, which makes us glad it was relatively small. Storyboarding is an essential part of the movie-making process, but how much of the original dream for a film actually makes it to the screen? In this side-by-side comparison of the asteroid field sequence from The Empire Strikes Back, we're able to see exactly how much of the sweet concept was transformed into reality. 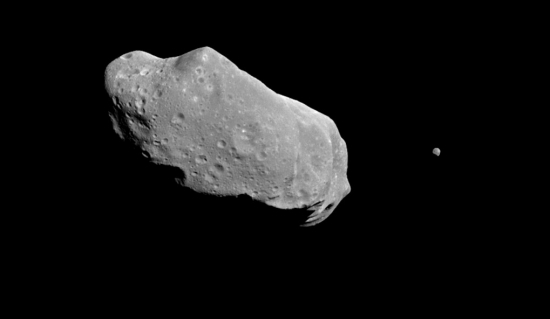 Take a look, because it'll (hopefully) be a while before an asteroid gets this close again. Asteroid 2013 NJ is just one object on NASA's list of near-Earth objects, but it's remarkable in that it flew by significantly closer than anything else on the list. Passing by at about 2.5 times the distance to the moon, it was close enough to be visible to the naked eye, even though it's diameter is relatively small at 120-260 meters. Presumably, this will unite all peoples within our nations. Like us, the United Nations also gets spooked by flying death rocks from space, and that's why they're moving forward with plans to create an International Asteroid Warning Group. The network of participating nations would let everyone know when there was an asteroid threat to the Earth and then launch a mission to ram it safely off course. They're not exactly 100% sure, but that's close enough, right guys? You might have heard that Ukrainian astronomers spotted a giant asteroid headed straight for Earth, which could impact on August 26th, 2032 with a force fifty times greater than the largest nuke. But wait; before you run off and get "YOLO" tattooed on your forehead, NASA is here to tell us that we're all going to be completely fine. Probably. While you were sleeping, an asteroid that was just discovered two days ago made a close pass by Earth at 2:35 a.m. ET. How close? Within lunar orbit close. There was nothing to worry about, as it was clear this asteroid -- roughly the size of the object that recently exploded over Russia -- had no chance of hitting the Earth. Though it is a little unsettling that it was discovered with so little time before its near miss, the bright side is that we discovered it at all. Every asteroid, it seems, has a silver lining. Well, by now you've probably seen and been equal parts terrified and mesmerized by the video of a meteor exploding in the skies over Russia, and if you haven't, take a couple of minutes and go do that right now, because seriously, it's incredible. When you're done, though, make sure you come back here to get an up close and personal look at 2012 DA14, a giant rock from space that so far as we can tell isn't going to explode in our atmosphere and blow out windows today, which is a nice change. Find out more about 2012 DA14 and watch NASA's live stream of the asteroid flyby -- complete with commentary from NASA staff, who are full of all sorts of useful information about asteroids -- right here starting at 2:00 pm EST. Here's a whole collection of different video recordings of the meteorite that streaked over the Ural Mountains in Russia early this morning (so, in the middle of last night for those of us in American timezones), breaking up in the atmosphere, leaving an impressive contrail, and causing a sonic boom that caused a wide radius of broken windows and damaged buildings. There have been no reported deaths so far, but many folks have sought medical attention for broken glass related injuries. A meteorite strike as flashy and dramatic as this one would be news on any day, but this isn't even 2012 DA14, the asteroid scienctists and astronomers were expecting to buzz very close to the Earth's atmosphere this afternoon. Naturally, this is leading a lot of folks to wonder if the two might be connected.